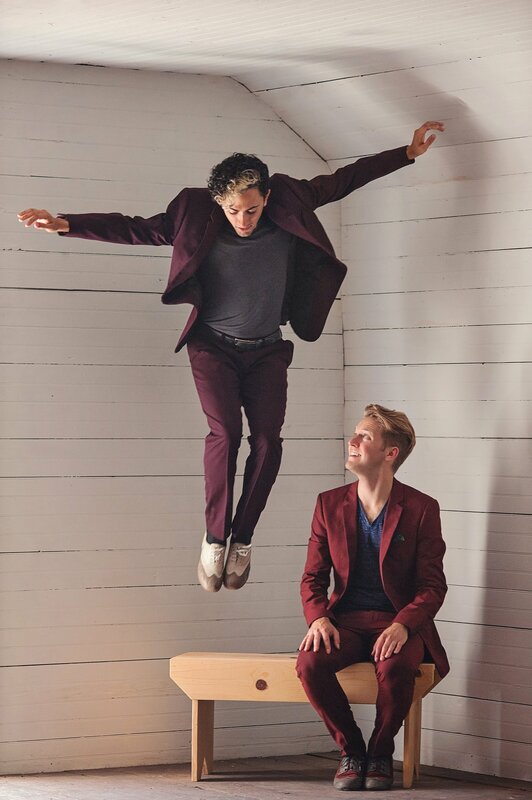 Connolly’s of Leap proudly presents… Caleb Teicher & Nic Gareiss – two of America’s most elegant interpreters of percussive dance. Caleb Teicher and Nic Gareiss move and sound together at the intersection of jazz and folk, social and solo dance. Caleb Teicher, a “sleek dancer who possesses a beguiling combination of a relaxed upper body with switchblade feet,” (New York Times) is an acclaimed choreographer, performer, and teacher based in New York City. Michigan-born dancer and dance researcher Nic Gareiss has been described as “the human epitome of the unbearable lightness of being” (Irish Times). Though lauded for their status within their respective genres, in this new 60-minute duo collaboration Teicher and Gareiss blur boundaries and playfully transgress, exploring improvisation, song, and the idea of percussive dance. Drawing on American tap dance, jazz, Appalachian clogging, and Irish step dance, Caleb Teicher and Nic Gareiss create a breathtaking evening of dance rooted in time and place yet uniquely their own; a festive dialogue of sound, movement, and corporeal rapport.